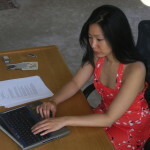 Tina Chang is the Poet Laureate of Brooklyn. The first woman named to this position, she was raised in New York City. She is the author of the poetry collections Half-Lit Houses and Of Gods & Strangers (Four Way Books) and co-editor of the anthology Language for a New Century: Contemporary Poetry from the Middle East, Asia and Beyond (W.W. Norton, 2008) along with Nathalie Handal and Ravi Shankar. Her poems have appeared inAmerican Poet, McSweeney’s, Ploughshares, The New York Times among others.